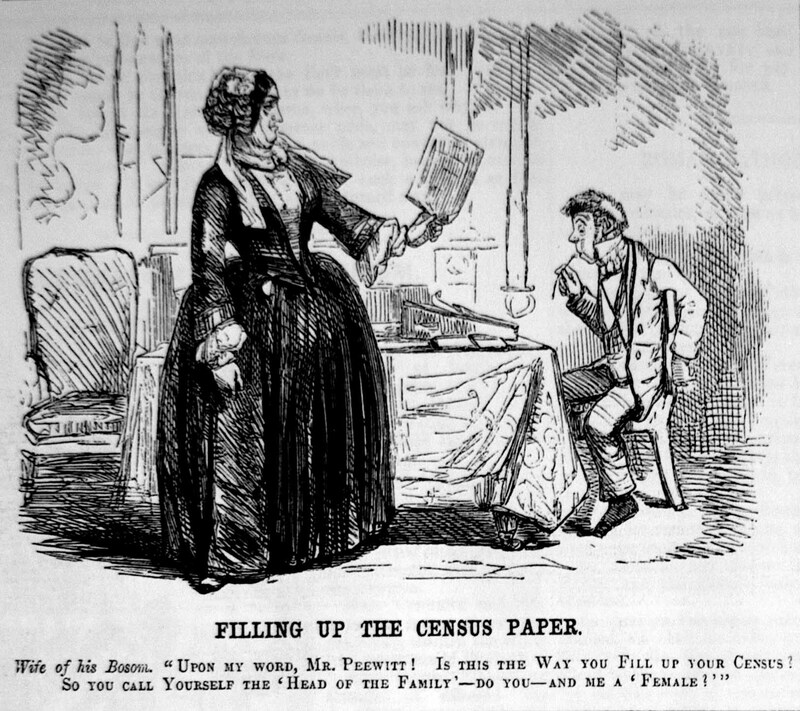 'Filling up the census paper', Punch, April 1851, p. 152. From the introduction of the modern census in 1841, the census anecdote or ‘curiosity’ became a regular feature of newspaper columns. With the 1851 census came a plethora of ‘amusing’ returns: an Anglesey householder including all his animals on his census paper; a rural householder near Belfast writing under the column ‘Deaf and Dumb’, ‘Husband, not deaf, wish he was’; while a householder in Great Bowden in Derbyshire wrote ‘married, and sorry for it!’ in the column on marital status. 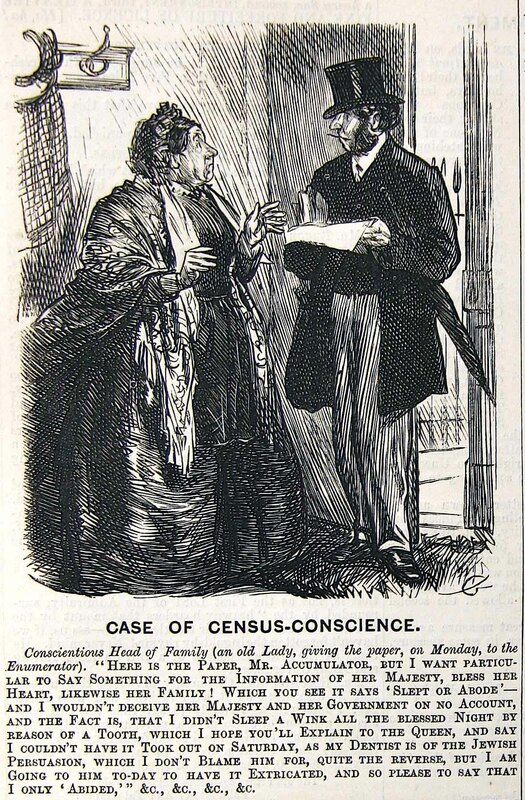 'Case of census-conscience', Punch, 15 April 1871, p. 147. The 1871 census brought stories of the death of a young woman in Liverpool while filling out her census paper, and the case of a householder in rural Devon who was fined £1 for refusing to fill out his schedule because ‘he knew neither his own name nor his place of birth.’ Coverage of the 1891 census included more stories of householders refusing to complete their returns and widespread coverage of the sad story of Lord James Douglas forced to appear before the West London Police court after his children filled out the census paper while he was ill in bed, describing his wife as a ‘cross sweep’ and a ‘lunatic,’ and his son as a ‘shoeblack.’ The public ridicule he suffered seems to have contributed to his tragic death by suicide on 5 May 1891. 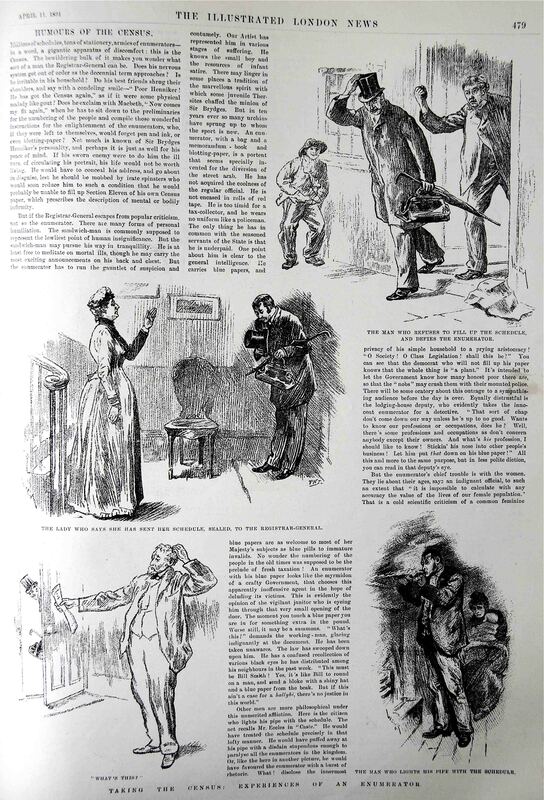 If newspapers found amusement or pathos in the census returns, others found opportunities for social satire, especially on the question of women stating – or rather misstating – their ages. This problem had been of serious concern to the General Register Office, the organisers of the census after 1841. In 1851, they suggested that women over 20 depressed their ages because they ‘choose, foolishly, to represent themselves as younger than they really are,’ a point reiterated by them even as late as 1901. From 1841 onwards, satirical publications seized on this subject to make polite social comedy. If The Satirist set the scene in 1841, arguing that the ‘vague’ question on age in the census schedule was in response to women not wanting to state their exact age, then Punch, founded in that year, took up the subject in almost every subsequent census. 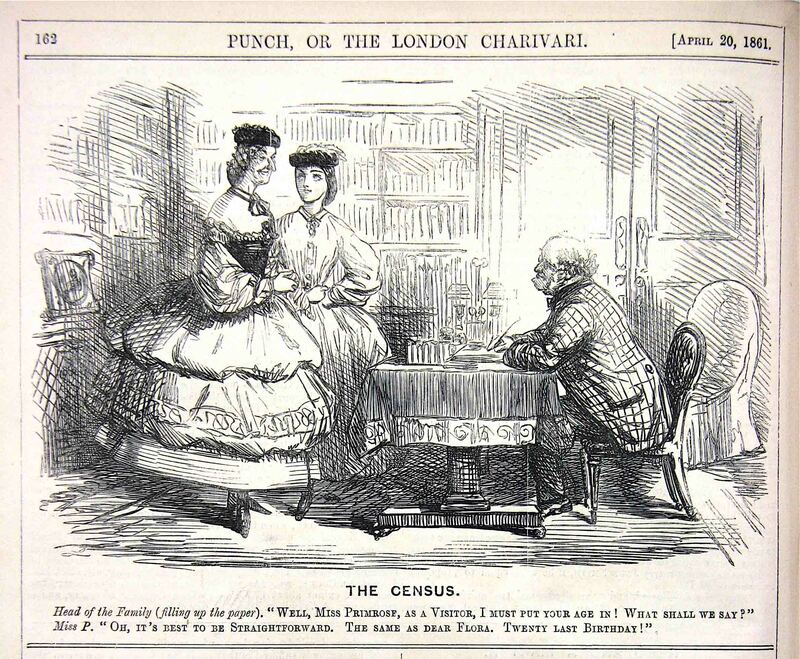 Its 1861 cartoon ‘The Census’, shown above, is typical of its coverage, showing a middle-class family of two with their census-night visitor grouped around a table, on which the elderly head of the household is filling in the census paper. Asking his equally elderly spinster visitor, Miss Primrose, what he should write for her age, she states ‘The same as dear Flora. Twenty last birthday!’ Such gentle satire could descend into outright farce: in the same year, the Adelphi theatre in London staged its own take on the census, titled The Census: a Farce in One Act, in which the census schedule took centre stage, around which a variety of social embarrassments were played out in quick succession. As a genealogist, I’ve studied lots of census records and totally enjoyed your insight into this topic. Thank-you Rosa! It’s amazing how many references there are to the Victorian census in newspapers and journals like Punch.